The spectacle is intended to draw attention to the opening event of this year's Harvest on the Harbor event in October. 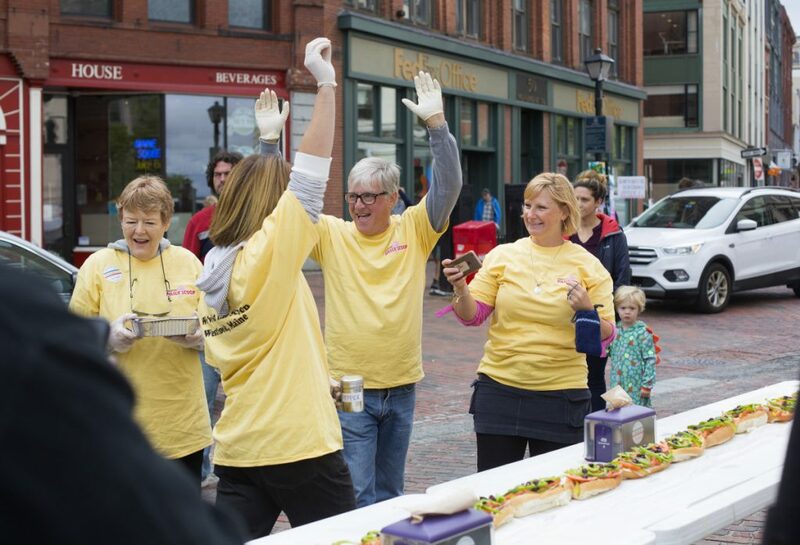 Eleven local sandwich shops gathered in Portland’s Monument Square late morning Thursday to build what may be the unofficial World’s Largest Maine Italian Sandwich – 160 feet from end to end. 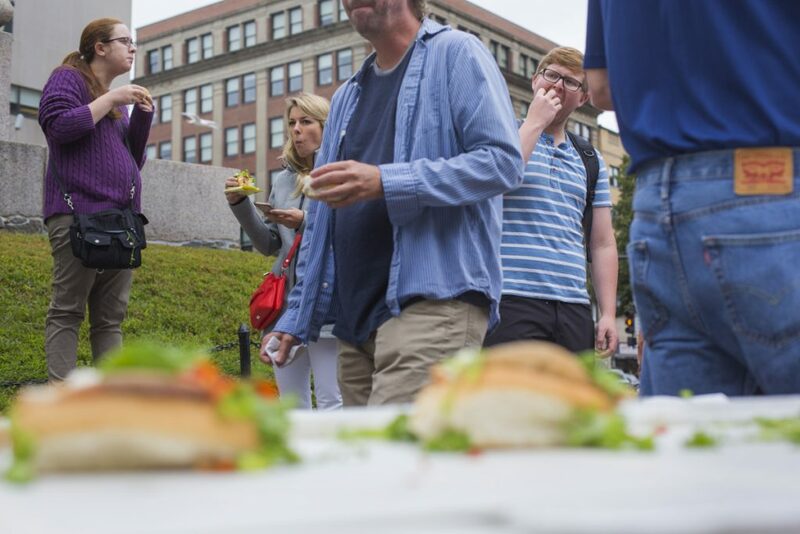 Spectators get to taste the results after local sandwich shops build a 160-foot-long Maine Italian sandwich in Monument Squaure in Portland on Thursday to promote this year’s Harvest on the Harbor event. The participants were, in part, trying for a record, but Guinness World Records doesn’t (yet) have a category for the sandwich. So Guinness suggested Portland have a trial run. Next year, the organizers hope do it again with a Guinness representative on hand to make it count. 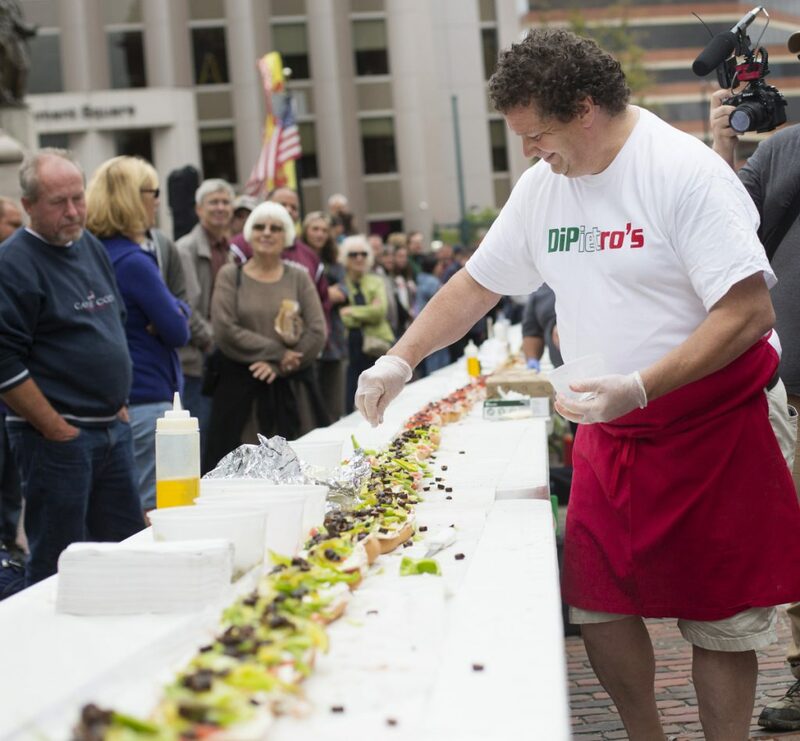 But the real reason behind the sandwich-making spectacle was to bring attention to “Different Roads,” the opening event of this year’s Harvest on the Harbor. The event, 6 to 8:30 p.m. on Oct. 18, highlights how immigration has influenced Maine food. Representatives from Corsetti’s in Westbrook celebrate after finishing their section of the sandwich string. Sandwich makers were A&C Grocery, Anania’s, Broadway Variety, Corsetti’s, Deb’s, DiPietro’s, Leavitt & Sons; Old Port Sandwich Shop, Otherside Delicatessen, Pat’s and Sisters Gourmet Deli. No Amato’s, though, which claims to have invented the sandwich in 1902. No official count of sandwich eaters, but there were “a lot,” Britt said, repeating “a lot,” for emphasis.